When I was a kid, I felt like a bit of a weirdo because I didn't know anyone outside my family that liked Brussels sprouts as much as I did. (Truth be told, that's not the only reason I was weird.) I even liked them boiled and stinky; I suppose that came from living in a Polish household where cabbage was a regular part of mealtime. Nowadays, it seems like everyone likes Brussels Sprouts, or at least restaurants seem to think so. More than any other vegetable, the mini cabbages are served in interesting ways. One never sees green beans or peas or broccoli done up "Buffalo style," or deep fried and served with pancetta, or in a Dijon cream sauce, but that's the norm for Brussels sprouts. And I like it! I was fortunate enough to marry someone who shares my affection for the little guys, so we eat them fairly often at home. We've even grown them (with mixed success) in our backyard garden. Ordinarily, we make them one of three ways: halved, tossed with oil, and roasted; leaves separated and steamed; grated raw in a salad. 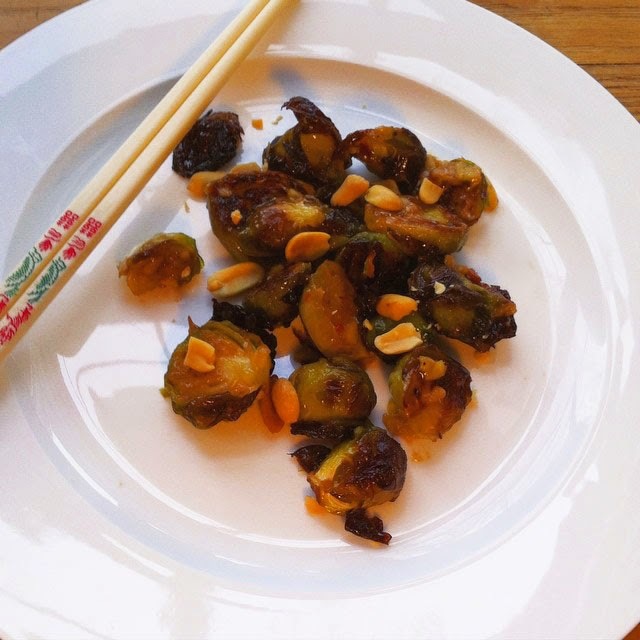 It's nice to mix things up sometimes though, so when I spotted a recipe for Brussels sprouts prepared in a kung pao-style sauce, and realized we had a bag of them in the crisper, it seemed like kismet. The original version of the recipe calls for double the amount of ingredients listed here. It also requires much more sambal AND a handful of dried chiles. While we do enjoy spicy foods, we find sambal oelek (at least the Huy Fong brand we normally buy) to be incendiary and cut back on the amount used. Your mileage may vary, of course. We cut back on the amount of sugar quite a bit as well; the sprouts were still delicious. Preheat oven to 425°F. Toss Brussels sprouts and 1 tablespoon of the oil, season with salt and pepper. Place on a foil-lined baking sheet and roast, turning once, until softened and browned, about 20 minutes. Remove from oven and set aside. Put remaining oil in a saute pan and turn heat to medium-high. Add garlic and ginger and cook for a couple minutes, stirring regularly. Stir in sambal, then add soy, sugar, vinegar, and 1/4 cup of water and bring to a boil. Mix the cornstarch with enough water (2 teaspoons or so) to make a runny paste. Stir into the sambal mixture and bring to a boil. Simmer until the mixture thickens enough to coat a spoon. Add cooked Brussels sprouts and toss to coat.